First of all, I *salute* Major Disappointment. Haha, thank you for ending it with that little gem. Okay, so I literally watched it an hour ago. At school. Sobbing. I love this series so much. 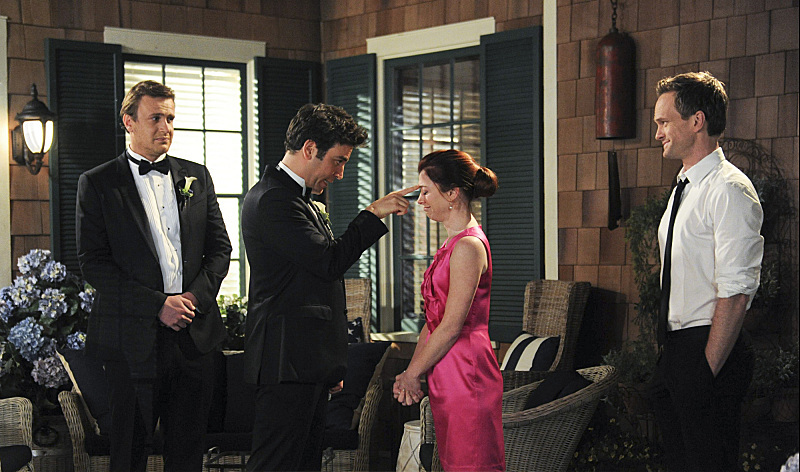 I loved when Barney met his baby girl (sob #1). I loved when Robin showed up at the McLaren’s right before the wedding, but loved even more when Tracy walked in through the door in her wedding dress and Ted was speechless. They are perfect together! I actually always understood the Ted/Robin relationship, and i love them together. However, I feel like once Barney and Robin got engaged she changed into an even colder, less loveable Robin than before. She almost became the girl version of Barney (besides the sleeping with everyone part). So my problem with them ending up together is that she isn’t the same Robin Ted fell in love with and I don’t think she’ll be the right wife for him/step mom for the kids. Although even still, I was actually decently satisfied with the ending, once I came to terms with his wife’s devastating death. Ugh. I guess I have mixed feelings. I’m still really emotional. I agree with the Robin not being the same Robin that Ted fell in love with, because that Robin wouldn’t have abandoned the gang like that. Also, she has FIVE dogs but she can’t make it work with Barney?! No sense. But I loved all the little callbacks to jokes and such and all of it felt real to me, but there was a lot to bum me out, as well. I don’t know. I’m very conflicted. I hated this ending so much! One of the things I think was wrong was over the last 3-4 seasons Ted has fallen out of love with Robin. She wasn’t the one and he knew it. He still loved her because he never found someone to make him forget her! Hell, we even had an episode this season about him letting her go. Robin has always been too selfish and too self absorbed for Ted. Once he found Tracy there is no way he would ever look back and long for Robin, especially after 10+ years of her being out of the picture. It was like they ignored all the growth Ted did over the last few seasons and even into the future. And since when did robin come back into the picture. They see here like once every 3 years and then the kids are like we love aunt Robin, ya cause they’ve seen her 5 times in their lives they love her. My biggest pet peeve is Ted and Tracy had real chemistry, I wanted to watch them, Ted and Robin haven’t had real chemistry since season 2. If Robin couldn’t give up her crazy lifestyle for Barney what makes it so she will for Ted and knowing that why would he go after her. Completely and totally agree with all of your points. People loved the Breaking Bad finale. It was pretty great. Just saying. But I know that there were people that also were unhappy with how that one went down. Also, I don’t know who you are, “Anonymous”, but I am guessing you are one of the people who has been berating me to watch Breaking Bad. I feel like that is a pretty safe guess. (1) After the series finale, it seems like Season 9 was completely disconnected with the rest of the series and finale. One of my biggest complaints about Season 9 was that the show tried to change Barney’s nature into something he wasn’t so he and Robin would make sense. I.e., he was actually this “good guy” (minus sleeping with everyone) who took down the evil corporate world and was going to settle down with Robin, to only find out both he and Robin only lasted three years! (2) Also, did anyone else feel like Lily and Marshall were kind of missing from the finale? Especially Marshall who just didn’t seem to get a lot of air time or seemed out of character. (3) And what was with Ted taking 7 years to get married! That was so unlike Ted. After watching a second time I started to feel a little better about this ending. I do not know why anyone cried, even the Barney scene. But here is what I got from it, that life has this funny way of changing you in ways you do not expect, even the closet group of friends. That’s it. Ted meeting the mother was just a red herring.